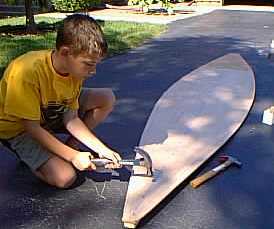 My compilation of safe boatbuilding materials for kids. 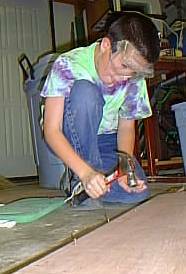 Drilling can be mastered at an early age. Mark the drilling locations, use drill stops....and be prepared to snap off of few bits!!! 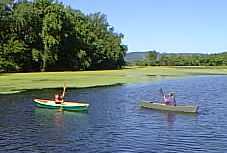 Make launch day a fun group activity! Set limits, watch carefully, but let them have fun and horse around (safely) with their creations! Lots of energy here! Mentors are critical! 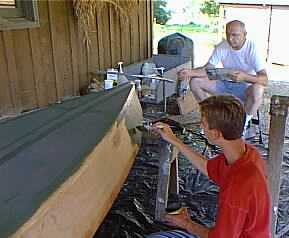 One mentor per boat seems to be a good rule of thumb for group projects (my experience, Mike Hanley's). 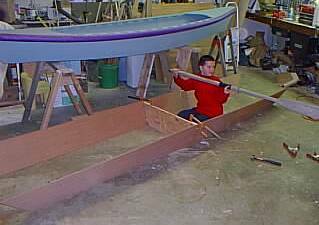 Mentors need not have experience with boatbuilding or woodworking (but Bill here did, and was a great help), just be able to keep kids moving along, listen and repeat instructions, and solve problems. In mixed age groups, older kids can be very effective mentors too! Young children hammer most effectively on the floor. Set them up, let 'em go, and take their time! 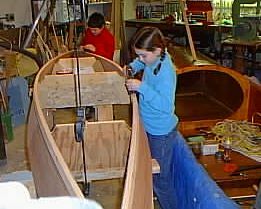 Boatbuilding strategies that take advantage of this are easier. 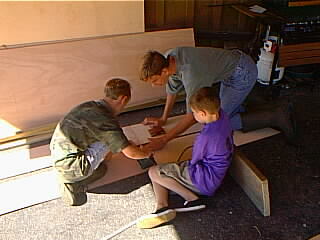 For example, in Wacky Lassie we preassemble chine logs to sides, and keel to bottom, flat and on the floor. 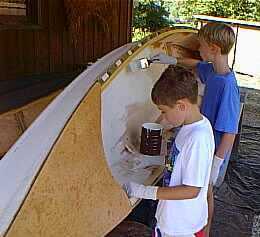 Then we bend around the molds. 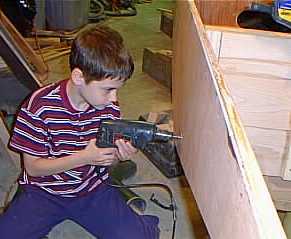 Nailing sideways, on the less solid molds, is harder for kids. Teams of 2 to 4 are very effective. 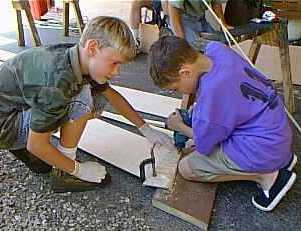 Taking time out to play with their projects is an important part of the process for kids!